It is believed that Sreeshanth the cricketer succumbed to temptation when he fell prey to bookies. That he was a "weak" personality. The weakness of character appears to be a widely held belief, mainly because of his known outbursts on the cricket field. normal thumb with a good balance of both phalanges, a good hand shape (broad with a good finger length and slim fingers) and a long, deep Headline which balances well the Heartline. This shows that Sreeshant is a smart and capable man with the ability to plan and get into the details. He has sufficient willpower, the ability to focus, and the ability to make decisions. He cannot be called weak. Check out a hand photo of his here or here. But if it was not specifically weakness of character that got Sreeshanth into trouble with the police, then what was it? The explanation lies in Sreeshanth's very long Apollo or Sun finger. As discussed in this post here, a slightly long Sun finger can be a positive sign, pointing to a person with an above average risk-taking ability and a high degree of competitiveness. Such people also tend to possess an optimistic outlook, and are seekers of wealth, leadership and success. They often have a nose for business if confirmed elsewhere on the hand. However, this applies to a slightly long Sun finger, and if the rest of the hand is good. Sreeshanth's Sun finger is far too long, quite out of sync with the rest of the fingers, which means he possesses a significantly disproportionate amount of the qualities mentioned above. His hand does not show the wisdom or the self-pride to keep these qualities in check. Any character trait in excess can result in seemingly irrational behaviour, unless alleviated by other qualities, or controlled and directed by very strong willpower. This is not the case with Sreeshant. His hand shows materialism and a desire for wealth and fame. In addition, there is a tendency towards envy, a desire for attention, and also significant cynicism, as shown by both the shape of his Saturn and Apollo fingers. While being a cynic by itself does not make a person behave irrationally, the quality of cynicism if allowed to take hold makes it easier for people to rationalise their actions. Cynics tend to have a slightly scornful attitude towards others, and a belief that people are inherently selfish and/or without ideals. The attitude is 'everybody is doing it so what is the big deal." However, finally why people behave the way they do is not an easy question to answer as it is usually because of an interaction of complex personality traits and the environment. Related posts: Mahendra Singh Dhoni 's hand reading or Sachin Tendulkar's hands tell us who he is or Saurav Ganguly's hands reveal the secret of his success or Shane Warne's hands match his reputation! or Rahul Dravid's hand reading or Pakistan's Imran Khan, or just click on the label "Cricket"
Many people in India carry on with their dubious activities, but only a few people are caught. Sreeshant just happens to be among that unlucky few. A pity that the IPL has become a corrupt institution. I think those who bet are guilty too. If betting is illegal, why do it. As I am doing some extensive research on certain elements of the hand, my book will take some time,maybe at least 2 more years. I think the original research will make it far better. I am going to publish something that is original and authentic, and also different from the stuff you see today. I do not consider the lines on upper mars as influence lines, unless you mean lower mars? I would consider the lines on the Mount of Venus as very important and to be considered as strong influences. Horizontal lines are not influence lines, but disturbances in the lives of the influences which affect the owner of the hand. 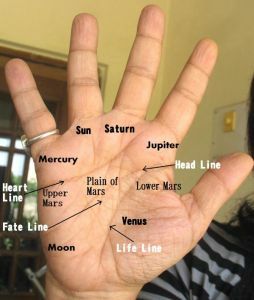 overall, the lines on our hand exist from the day we are born. We are born with some inherited tendencies, and thus an inherited future too! These lines can change rapidly in childhood. And yes it is the subconscious which maps out a future, which ofcourse is subject to change. I do not believe in a fixed fate. However people who believe in it, tend to get it as they do less to fight it. Sure, you did not choose to be born the way you were. But the answers to why you were born the way you are lies in genetics and science, and ofcourse chance. Our decisions and actions are certainly affected by the way we think, and the way we think is determined partly by our genes and partly by the way the environment shapes the genes. When it comes to a trait like cynicism, I do take into account several signs and yes the Moon Mount is to be considered, as well as some other signs which I prefer not to talk of here. I agree that its easy to tell someone to change, easier said than done. People with will power and motivation change for the better, and weak people change for the worse. And no you do not bore me. I welcome questions like yours because it helps a lot of those who come to this website and try to understand what hand reading really means. yes i meant the vertical lines running along the lower mars mount down to the mount of venus..my bad...are those always people...or familiar set of circumstances..if they are people...then certainly we are dealing with things on a much deeper scale...showing their impact on our lives...to be much more then we are consciously aware of atleast till the time we become self sufficient...i intuitively believe this as a strong sign between a parent and a child...especially the mother...especially the kind who are more sensitive to their offspring and are attached on a much more deeper level. These influences are people. The influences can be anyone, friends, parents, siblings, lovers. Remember these lines show a one-way influence only. If the line is on a child, it may or may not be present on the parent, or at least not until the child grows up and starts to influence the parent, if at all. These lines show influence and impact and also very close emotional connections, and their absence does not show an absence of love. So in a way the influence lines tell you a lot about the person on whose hand they are found. The more the influence lines, the more the subject is connected to people at a deeper level. Amazing analysis,Cant wait for your book I believe it will be available on all online marketing stores in our country ex: Flipkart. BTW nita who do you think is the best politician for our country I have read your analysis on akilash yaduv, nitish kumar all seem to be very positive,who do you think is the best I mean the best ? Yes, people like Nitish Kumar and Akhilesh Yadav have some positive traits, but unfortunately their circumstances and the type of politics in our country (sectarian) is a great limiting factor for them to do really something great. I think we need a very strong leader with great integrity and also someone who is a very good administrator, and I am not sure whether we have anyone like that.